Figuring out which of the government’s data streams will continue to flow and which have been stoppered is complicated, not least because some agencies were fully funded before last month’s budget negotiations reached a stalemate, and thus have been able to keep operating. 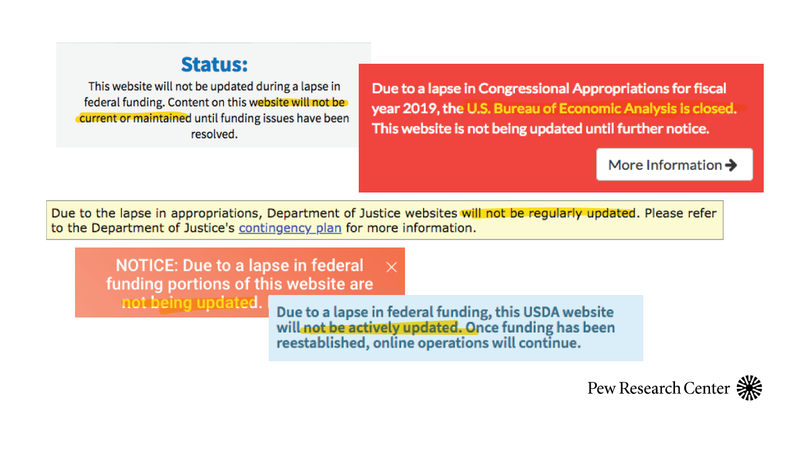 Here’s a look at what data are and are not available during the shutdown, from what we’ve been able to find out via agency release schedules and planning documents, third-party calendars, and our own reporting. Bear in mind that, based on past experience, scheduled data releases may be delayed because of information-gathering backlogs even after the budget impasse is resolved and agencies fully reopen. The Census Bureau has ceased most operations, other than planning for the 2020 count. That means, among other things, no November data on new home sales (which were supposed to come out Dec. 27), construction spending (Jan. 3), manufacturers’ shipments, inventories and orders (Jan. 7) and international trade (Jan. 8). Unlike previous shutdowns, however, the Census website is running, giving people access to previously published data. The Federal News Network reports that the bureau has six to eight weeks of “carryover funding” it can use for planning purposes, but should the shutdown last longer than that even that work would cease. Activities funded otherwise than by annual appropriations, such as those paid for by other agencies or “non-Federal entities,” may also be continuing. Like Census, the Bureau of Economic Analysis is part of the Commerce Department, and also has ceased operations for the duration. That could affect the bureau’s first estimates of fourth-quarter and full-year 2018 gross domestic product, which are supposed to be released on Jan. 30. The Bureau of Labor Statistics is fully operational, as it is part of the Labor Department (which was funded back in September). That means the inflation report for December, scheduled to be released Jan. 11, is on track, a spokesman told us. That also goes for the releases of detailed jobs and unemployment data for December (the national-level data came out Jan. 4, and data for states and metro areas typically follow a few weeks later). But plans for the January jobs report, data for which are supposed to be gathered next week, are still uncertain: The BLS conducts the payroll survey of employers itself, but the Current Population Survey (which generates the data used to calculate the unemployment rate) is a joint effort with the Census Bureau. The Agriculture Department’s main statistical offices, the National Agricultural Statistics Service and the Economic Research Service, are both closed. That means farmers will not have current data on global supply and demand for farm products, crop and livestock production estimates, and other agricultural economics matters. However, the Agricultural Marketing Service is continuing to provide market-price data for meat, grain, dairy products and other commodities. The Bureau of Transportation Statistics, part of the Department of Transportation, had been operating normally except for the Office of Airline Information. However, a notice posted Tuesday said that, except for the Transportation Services Index for November (scheduled for release Jan. 9), all other statistical releases would be delayed due to the shutdown. Not affected by the shutdown, because their departments have been fully funded by already-enacted appropriations laws, are the Centers for Disease Control and Prevention, the National Center for Health Statistics, the National Center for Education Statistics and the Energy Information Administration. The Federal Reserve, which doesn’t rely on Congress for funding, issued its monthly report on consumer credit on Jan. 8, and is scheduled to release its monthly report on industrial production and capacity utilization on Jan. 18. The Federal Housing Finance Agency, which funds itself through assessments on Fannie Mae, Freddie Mac and the 11 Federal Home Loan Banks, has continued its closely watched monthly reports on house prices and mortgage rates.